Preventing the knee from sliding or twisting abnormally when the leg is straight or slightly bent. Preventing the knee from being stretched or straightened beyond its normal limits (hyperextended). Supporting the knee ligaments that keep the knee from bending sideways. 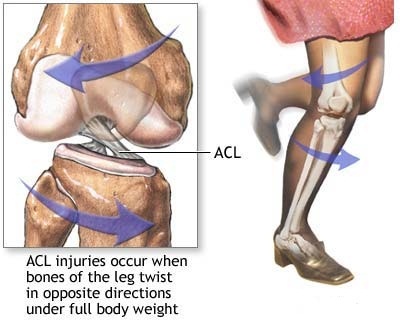 When the ACL tears, the blood vessels around the ligament tear and blood can fill the knee joint, causing swelling. This can result in both pain and loss of motion. The inactivity following an ACL injury often results in weakening of the muscle in the front of your thigh, the quadriceps. If nothing is done after an ACL injury, you may develop chronic ACL deficiency-your knee may become less stable, leading to abnormal knee joint movement and premature osteoarthritis. 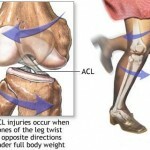 Treatment is needed for an ACL injury. Treatment is either a rehab program or ACL surgery followed by a rehab program. Surgery is generally more successful if you condition your knee and surrounding muscles before starting your treatment. 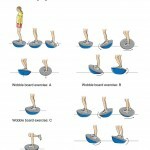 This can be achieved by doing a few simple exercises. Your doctor will help you decide when to start these exercises. If you’ve recently suffered an anterior cruciate ligament injury (ACL) the following exercises can get you on the road to recovery. Quad sets, straight-leg raises, and heel slides are common exercises used after an ACL injury. As symptoms decrease and you are able to bear weight, side-lying leg lifts, glute sets, bridges, mini-squats against a wall, heel raises, and prone hamstring curls might be added. But your doctor may want you to tailor exercises to your specific injury. Check with your doctor before you do any exercises. Exercises you can do as tolerated, include the following. Heel slide: Sit on the floor with legs outstretched. Slowly bend the knee of you injured leg while sliding your heel/foot across the floor toward you. Slide back into the starting position and repeat 10 times. Isometric Contraction of the Quadriceps: Sit on the floor with your injured leg straight and your other leg bent. Contract the quadricep of the injured knee without moving the leg. (Press down against the floor). Hold for 10 seconds. Relax. Repeat 10 times. Prone knee flexion: Lie on your stomach with your legs straight. Bend your knee and bring your heel toward your buttocks. Hold 5 seconds. Relax. Repeat 10 times. Add the following exercises once knee swelling decreases and you can stand evenly on both legs without favoring the injured knee. Passive knee extension: Sit in a chair and place your heel on another chair of equal height. Relax your leg and allow your knee to straighten. Rest in this position 1-2 minutes several times a day to stretch out the hamstrings. Heel raise: While standing, place your hand on a chair/counter for balance. Raise up onto your toes and hold it for 5 seconds. Slowly lower your heel to the floor and repeat 10 times. Half squat: Stand holding a sturdy table with both hands. With feet shoulder’s width apart, slowly bend your knees and squat, lowering your hips into a half squat. Hold 10 seconds and then slowly return to a standing postion. Repeat 10 times. Knee extension: Loop one end of Theraband around a table leg and the other around the ankle of your injured leg and face the table. Bend your knee about 45 degrees agaist the resistance of the tubing and return. One Legged Standing: As tolerated, try to stand unassisted on the injured leg for 10 seconds. Work up to this exercise over several weeks. This entry was posted in ACL Injuries and tagged abnormal knee joint movement, anterior cruciate ligament, halfsquat, hamstrings, heel raise, knee extension, one legged standing, passive knee extension, premature osteoarthritis, quadriceps on December 23, 2011 by alwin.